I have fished with this guide for 30+ years, he was born, grown up and still lives a 1/4 mile from Cape Point. He can read the sea and the weather like you can read the newspaper and in all the time I've known him, he has predicted with great accuracy what we would catch and when we would catch it and equally when it is a total waste of time even to wet a line. 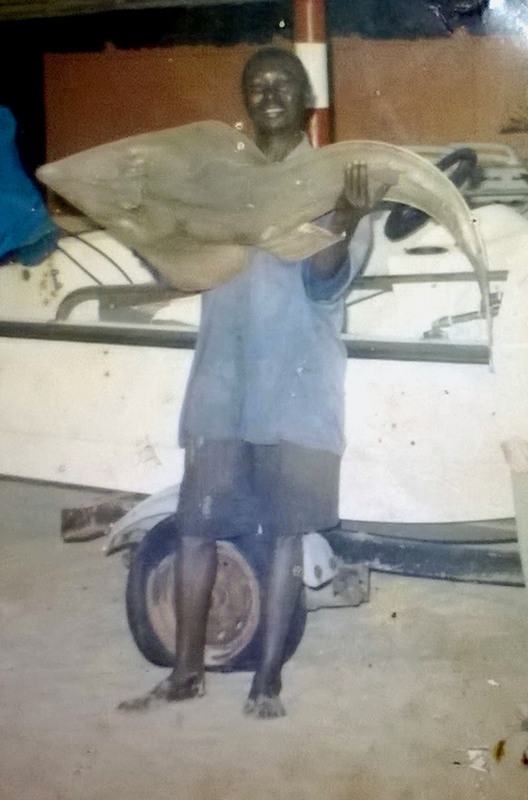 I have seen him catch huge guitar fish as big as himself and if I tell you that he has built a house, raised a family, put 3 children through university, all by beach fishing two tides a day with rod and line, fantastic work if you can get it. A few years ago he branched out into boat fishing when his son, an architect in Scandinavia bought him a boat. He employs a local captain to take you out around the creeks or the inshore marks to fish for all the local species. On my worst day out with him we still had 11 species on the boat. With a lifetimes experience of the local waters, in my opinion there is no better skipper in the Gambia. The boat is basic, a 16' unsinkable, double skinned, Scandinavian job, with a pub umbrella for shade. There is no luxury saloon or tea making facilities but most of us have travelled the 3000 odd miles to catch big fish. This is not the English channel where you have to hide from wind and rain, nor is this a magic place where fish jump in the boat for any idiot with a hook. If you can fish in the UK and you actually catch regularly and you know what you are doing you will be absolutely astounded what you can catch in the Gambia. If you can't catch in the UK and are just a tackle tart that loves showing off all his new gizmos, you still won't catch in the Gambia so just stay home. 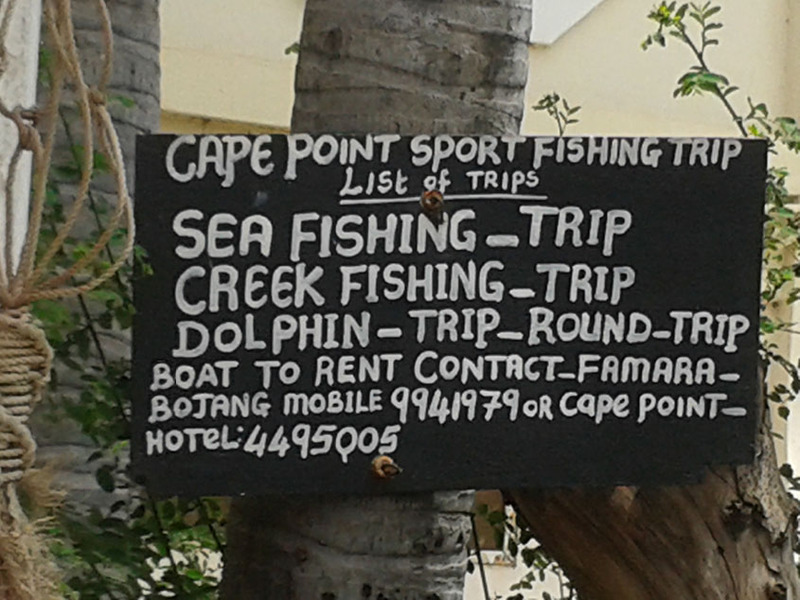 The fish in the Gambia are far more tolerant of bad bait presentation and poor angling practices. However they are not completely stupid, you do have to put in some effort plus just about everything has a gob full of teeth and I would strongly advise that every hook you chuck out has got wire attached. You can obviously catch live bait and tiddlers on mono which you can then use as live bait for what you have actually come for. You can book through us if you wish, email or phone for full details, or you can ring Famara direct or you can contact him through the Cape Point Hotel, numbers to call on these photos. Depending on currency fluctuations, and they are up and down like a fiddlers elbow, you will usually get change out of £45 per man per day. 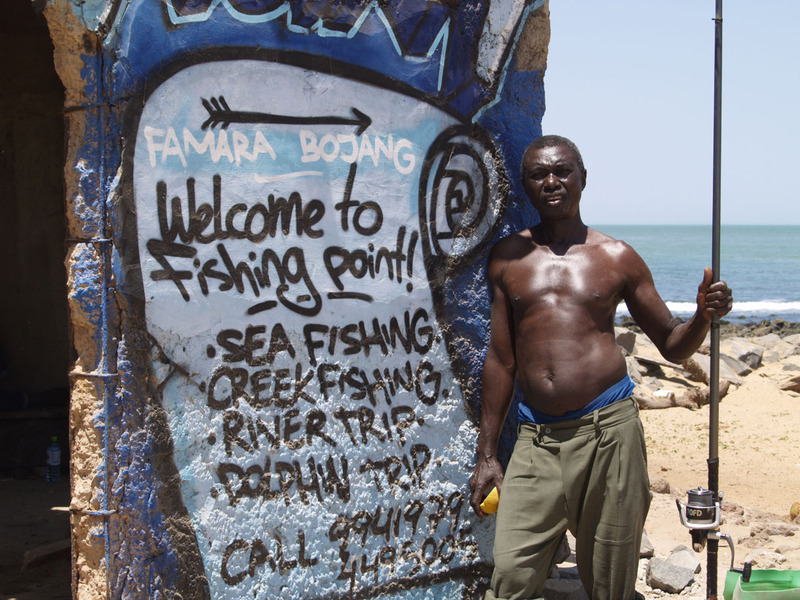 Famara also understands the concept of catch and release which is bloody rare in Africa. 90% of the locals you see out there will have your fish headed, skinned and gutted before you've unhooked it. On dozens of occasions I have been fishing on the beach only to have someone appear from absolutely nowhere, rush into the sea, grab my fish and beat it to death before I've had the chance to say good morning!